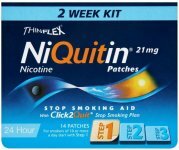 Nicorette Quickmist Spray is a unique form of Nicotine Replacement Therapy (NRT), an instant release mouth spray that gets to work on cravings in 60 seconds. The new mouth spray format is the first of its kind, and exclusive from Nicorette. It is easy to use, discreet and convenient - perfect for tackling nicotine cravings on the go. The fresh-tasting minty spray provides small doses of therapeutic nicotine to help manage the nicotine withdrawal cravings you get when quitting. You can use Nicorette Quickmist whether you want to stop smoking completely, cut down the amount you smoke, or simply use as a safer alternative when you can't or don't want to smoke, for example in front of children, at work, or when travelling. Nicorette Quickmist is ideal for use on the go. The handy, discreet packaging fits easily into your handbag or pocket, so you can help to relieve your nicotine cravings wherever and whenever they strike. The portable mouth spray fits conveniently into your life whether you're at home, in the office, out with friends or just walking down the street. The therapeutic nicotine from the spray is rapidly absorbed through the lining of the mount, and can get to work on nicotine cravings in 60 seconds to give you fast relief from your withdrawal symptoms. Upon first use, point the nozzle away and press the top of the dispenser several times until a fine spray appears. If the spray is not used for 2 or more days this may need to be repeated. To avoid getting spray down the throat, don't inhale while spraying. For best results, don't swallow for a few seconds after spraying. Use Nicorette Quickmist when you would normally smoke. Users should use 1-2 sprays when they would normally smoke or have cravings to smoke. For most smokers this means about 1 or 2 sprays every 30 minutes to 1 hour. The maximum does is 2 sprays at a time, 4 sprays per hour and 64 sprays per day. Tingling lips - some users have reported a mild burning sensation on their lips if they come into contact with the spray. This is completely normal and nothing to worry about. To avoid, simply take care not to get any spray on your lips. Hiccups - Some users also report getting mild hiccups when using the spray. Don't worry, this is a common side effect for oral forms of NRT. Strong taste - Some users have reported that Nicorette Quickmist has a distinctive, strong taste. This is quite normal for NRT products due to the strong taste of nicotine, the active ingredient. Always read the packing and labels before use. 1mg of nicotine, propylene glycol, anhydrous ethanol, trometamol, poloxamer 407, glycerol, sodium hydrogen carbonate, levomenthol, mint flavour, cooling flavour, sucralose, acesulfame potassium, hydrochloric acid, purified water.